Legendary recording artist Richard Clapton burst onto the scene in the mid-70s, injecting rock ‘n’ roll with his distinctive Australian voice and outlook. His timeless classics have culminated in over one million albums being sold and his love of performing led him to recently describe his life as a version of the ‘never-ending tour’. Now celebrating his 45th year in music, the iconic rocker has undoubtedly lived a full life – surviving countless highs and lows, victories and losses and battles of all variety. He might be forgiven for having a somewhat jaded outlook on the current times, but his belief in music continues to send a strong message about its role in our lives and why support for artists is more important now than ever. “I have seen it all and over 45 years the music scene has changed tremendously,” says Richard, reflecting on the contrast between the flourishing music industry of previous decades and today’s climate. “The live music scene was extremely healthy in Australia for many years and a lack of government and community support has really taken its toll. Venues have closed down at an alarming rate and there are far too few avenues for live music these days. That is why venues like Melbourne Recital Centre are so important” he says. Pointing to festival culture as a key driver of opportunities for the next generation of young artists, Richard remembers a “Golden Age of OZ rock when bands used to perform four or five times week, all year round” which he puts down to greater available opportunities and fans who maintained an unswerving devotion to bands. “Are artists supported the way they used to be? Unfortunately, no. Back in the day, there were so many avenues of support for music artists and most importantly there was fan loyalty. Artists succeeded or failed on their own merits and the quality of their own work. If an artist believed strongly enough in their music and had enough stamina and persistence they had a good chance of establishing a worthwhile career thanks to the numerous avenues of support” says Richard. For all the barriers to success, the artist believes it’s no match for a musician’s pure determination and grit. This, he tells us, is the true secret to surviving in one of the toughest – and most wonderful – industries out there. “A career as a musician is one of the most fulfilling life choices. Although the odds are stacked against young artists nowadays it is still possible to build worthwhile careers in music. There are all kinds of new avenues opening up whereby young artists can use innovation and “rat-like cunning” to actually eke out a decent living. There are so many new ways to get your music out there. So I guess just “don’t let the bastards get you down” and if you truly believe in your music, your time will come” he says. To think of bands and musicians throwing all the safe options out the window to pursue music is perhaps to glimpse the essence of why we idolise them so unreservedly; what feels like a myth continues to be written back into the history books by our favourite performers. 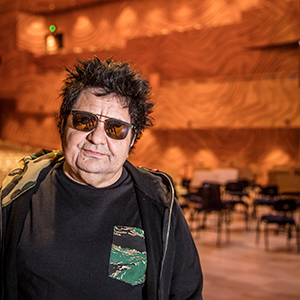 Richard Clapton performs at Melbourne Recital Centre on 12 October, celebrating 45 years of legendary music-making with songs from acclaimed recent releases and his greatest hits.